POP vs. IMAP: What Do They Mean and Which One Should You Use? Here is a quick explanation about what does POP and IMAP mean and when should you use POP and when to use IMAP. These days, everyone and their mother uses E-mail. It’s one modern technology that has totally transformed the way we communicate with each other. From the early days of Hotmail and Yahoo Mail, when Webmail used to look like something coded in Notepad and mailboxes were 5-10 MB tops, to the modern day Webmail services that can do almost everything (Chat, Voice Calling, Social Networking, video calling, to name a few) and have practically unlimited storage, E-mail surely has come a long way. But deep down, the core technologies that drive E-mail communication have remained more or less the same. Although these days, majority of Email users login to their E-mail service providers’ webmail UI to handle E-mail communication, thanks to the increase in both the speed and stability of Internet connectivity, it wasn’t always the same. Back in the days, when a 28.8 or 56 Kbps Dial-up connection was all a normal person could afford, Email communication was mostly handled using Software known as Email Clients. To clarify, an Email client is a software that enables you to access your Email without having to open up your Webmail provider’s Email portal. Now, these Email clients need to access our Email from the service providers’ mail servers in order to enable the users access to their Email. And this is where POP and IMAP come into play. They are protocols (a set of rules that govern how a particular system works) that define how E-mail clients interact with the E-mail providers’ servers. Heralded as two of the best known protocols of the TCP/IP stack, POP and IMAP enable power Email users to work with their Emails, the way they want to. E-mail client connects to remote webmail provider’s (Gmail, Yahoo etc.) mail server through user’s credentials (username & password). All email messages present on the server are fetched by the email client, and stored as New mail (unread) on the user’s machine. After all the messages have been downloaded to the user’s machine, the same are deleted from the email provider’s server (s) (this is optional). The email client disconnects itself from the remote server. Thus, POP focuses on the fact that user should have access to all his/her E-mail locally, at all times. email client connects to remote webmail provider’s (Gmail, Yahoo etc.) mail server through user’s credentials (username & password). Instead of downloading the entire email (textual and graphic content, attachments etc. ), only basic information (List of new emails, email headers etc.) is cached locally on the user’s machine. Entire email content is downloaded only at the explicit request of the user (For example, when a user clicks to read a rich HTML E-mail with attachments, all these are downloaded). Disconnect after syncing the changes to the remote server. Clearly, the working of IMAP is a little more complex than POP. Also check out: What is IRC? POP vs. IMAP: How they differ? POP downloads users’ email locally entirely, making their communication accessible at all times. On the other hand, IMAP just grabs the necessary information unless the content is explicitly requested by the user. POP is more of a passive protocol, that downloads your email locally, deletes it from the mail server, and disconnects from the server. By contrast, IMAP is an active protocol that syncs the changes you make to your emails locally to the server. POP gives the users more control over their email, making it accessible and private to them at all times. IMAP, on the other hand, ensures that users can access their emails from different machines, regardless of their location, as long as Internet Connectivity is there. POP just downloads the bulk of email in one go, while IMAP maintains directory structures at all times (due to its capability to sync changes), on all locations where email is present. This essentially means that the E-mail sent from the E-mail client will appear in the “sent” category of E-mail client, as well as Webmail. Tip: Though POP’s default behavior is to locally download the E-mail and then delete it from the server, modern E-mail services/clients can be configured to leave it on the server, if the user desires so. 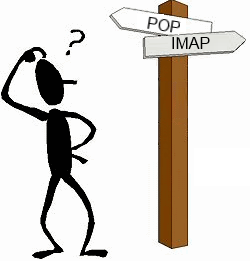 Which one of POP and IMAP should you choose? If you want complete access to your E-mails locally, at all times. You normally work on your E-mail from a single machine. The storage space on your Email provider’s server is limited. You have unreliable Internet connectivity. You want to consolidate E-mail from different accounts into a unified inbox. If you want your E-mail readily accessible from multiple machines, and multiple locations. The storage space on your local machine is limited. You have a stable and almost always on Internet connectivity. I know I haven’t given any recommendation around which protocol to choose, but I really can’t. It purely depends on how you interact with your email. I have long stopped using email clients and rely on webmails only, especially since emails have been available on smartphone too. If you are interested in knowing more about these protocols, you can check Wikipedia for POP and IMAP. Let me know in comments if you have any thoughts on these protocols, and if you have any favorite among these.